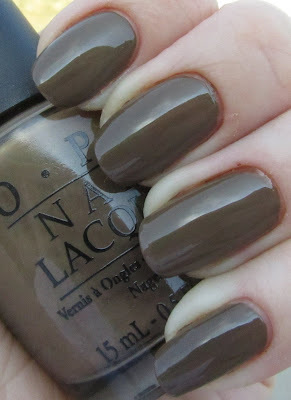 Here is the second half of the OPI Touring America Fall 2011 collection! This half includes six creme shades, in more neutral shades such as grays, browns, and greens. All pictures are shown with no base coat, with top coat, in natural outdoor lighting. Light smoky gray creme. This had really great application - actually, all of the polishes in this half had wonderful application. Might have to do a comparison between this and Zoya Dove. I really like light grays like this. Another light gray creme, but this time with a touch of green to it. It almost looks like a really pale sage green? Maybe it is a light green creme with a touch of gray, haha. Hehehe... I am slightly amused by this name. This is an army-green creme. I find that on my skin tone these olive green colors are kind of hit or miss, but I like this one on me. Dark brown creme. Very nice fall shade. This is an interesting color. It's a dark, murky purple-gray. It is kind of a hard color to capture on camera, but it's very pretty. This half the collection applied really wonderfully smooth in two coats for full opacity. I had no problems with streaking like I did with some of the shimmers. I also feel like all of these colors are definitely very fall. While I love shimmery, sparkly polishes... sometimes a nice creme is just so refreshing! Overall, I really like this entire collection. I feel like it has a nice range of colors, so that everyone can find at least a few polishes that will suit them. A great addition to fall polish! DISCLOSURE: The polishes featured in this post were provided to Polishology by OPI for review purposes. This is an honest and independent review and was in no way influenced by the company. I actually don't like the dark cremes that every company seems to be releasing for fall. I much prefer the bright colors or shimmers. OPI Holiday 2011 Collection - The Muppets!